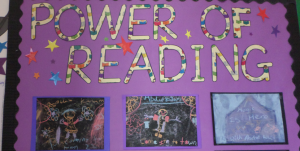 The Centre for Literacy in Primary Education's Power of Reading training programme has supported thousands of schools in raising engagement and attainment in reading and writing for all pupils. This website has teaching sequences for over 200 children's books for all year groups in the primary phase as well as more than 1000 practice examples. I'm delighted that Dark Sky Park will be one of the scheme's recommended texts for 2018-19, launched by a reading at the introductory session at CLPE on Wednesday 10th October.